When thinking of something as instrumental as the appearance of your car, style is of utmost importance. This statement is particularly true when you have opted for a model as sporty as the E63 AMG; a car which can reach 0 to 60 mph in a time that would make most supercars jealous. Adding a little extra such as front radiator grilles will give your car a racier look and potentially even improve its performance, as the wire mesh will stop road debris from entering vital parts of the car. Enhancing the look of your pride and joy with after-market parts is often a great way of reaching this objective. This part remains within the spirit of the other performance vehicles that are based on Mercedes' finest vehicles such as Brabus. The racier look isn't everything though. This radiator grille set for Mercedes AMG E63 is made of the best materials available and is assembled by some of the finest craftsmen. Be aware that this grille kit is only available in black, so it will look great whatever livery you have chosen for your E63 AMG. Thus, it ensures this part truly blends in with the look of the car and enhances its already stunning lines, rendering the car even more elegant than it was previously. They are available in both Black & Silver. Not only is this part stylish, it is also very easy to fit. None of the vehicle's body parts will need changing, so there won’t be a need to take the car to a garage and have it off the road for a few days. The only tools required to fit the grille are 2 screwdrivers so almost anyone can fit it. 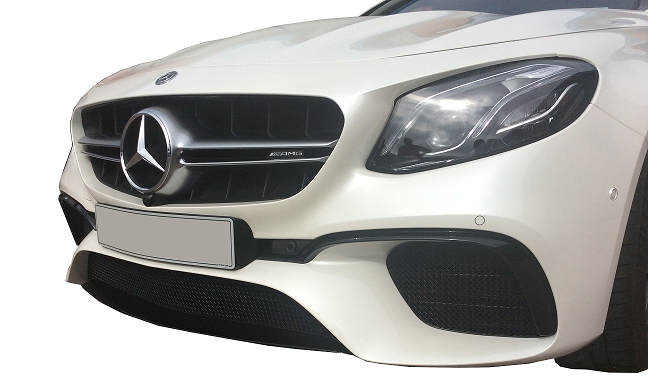 The radiator grille kit contains a lower grille kit and outer grille kit, therefore enabling your E63 to have a uniform look and turning this already stunning Mercedes model into a real looker. This part can be fitted to all the body styles in which the Mercedes E63 AMG is available, so that means that the estate version of this model can benefit from the elegance and enhanced performance that is provided by this new grille. This grille is now in stock at Zunsport so order yours today.